Fashion. Some readers of historical romance will tell you it is one of the reasons they enjoy the genre. Love of clothing certainly fuels the continued popularity of all things Jane Austen in literature, movies, and television. The same applies to a slightly lesser degree to Victorian stories, both from the early era of wide skirts and broad sleeves to the late Victorian cinched waists and bustles. When an author chooses to step out of those familiar worlds, description can become a challenge, as is certainly the case in my current work in mid-19th century China. Chinese clothing stems from roots deep in the Han dynasty, which began in the second century BC. In very general terms, it consisted of a sort of blouse, jacket, or robe that wrapped around the body and worn over pants or for women more often a skirt. Like most generalizations, view that one with caution since both sexes worth both pants, skirts, or long robes during various periods. The classic style is often called hanfu, but that is a modern term. In actuality each dynasty in Chinese history has its own variants of traditional clothing with unique colors, motifs and style elements such as sashes, sleeve widths, or robe/jacket length. The fashion for each dynasty would have its own name. The Jurchen, a minority people within China also known as Manchurians, took control of the Imperial throne in 1644. Having taken the “Mandate of Heaven,” they styled themselves the Qing Dynasty, known in the West as the Manchu. By retaining such traditional Chinese elements as the bureaucracy based on scholar-officials, the capital in Beijing, and a multi-ethnic army, they were able to quickly consolidate power. Initially intermarriage was encouraged as well. Similar consolidation took place in Qing fashion. The first emperor decreed that court officials wear Manchu style of dress. 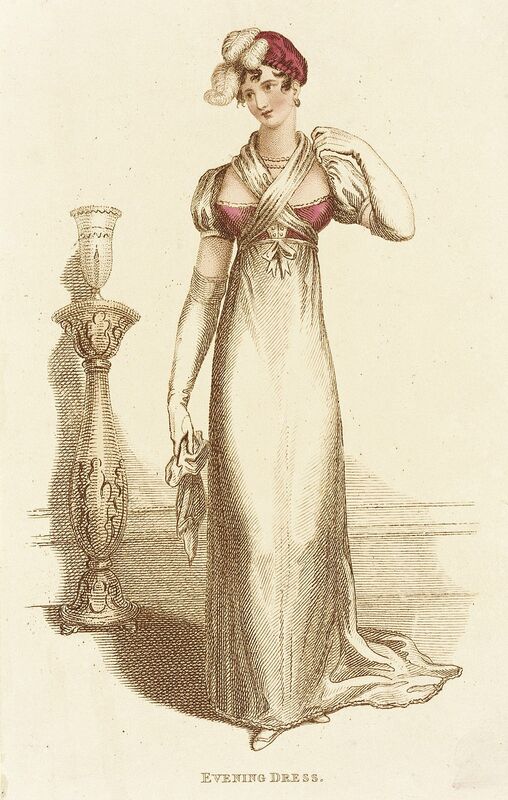 In pictures, this style appears similar to traditional dress, but somewhat heavier and boxier. Han Chinese civilians, rich and poor continued to wear their traditional style. Some crossover features were inevitable. 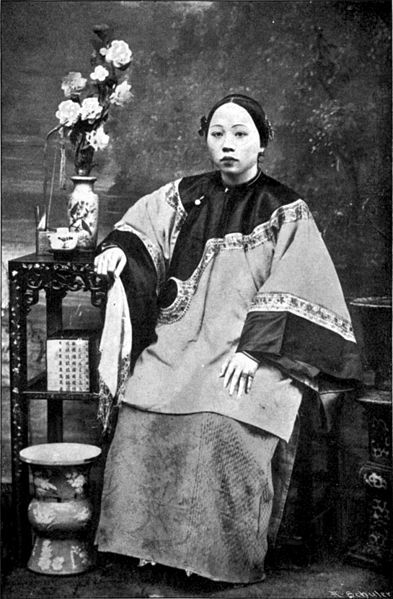 By the mid-1800s dress for upper class Manchu women consisted of a heavy, hip-length blouse or jacket called an aoqun over a pleated skirt with little or no body contour. 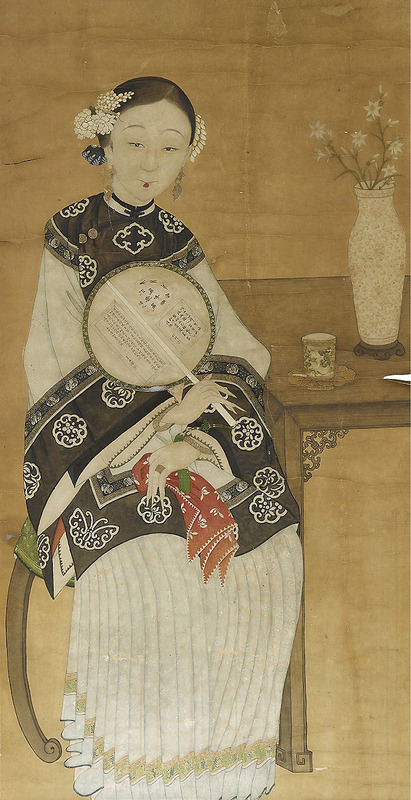 While Manchu traditional clothing included narrow sleeves, in this era they often borrowed the wide sleeves of Han tradition. The neckline might be decorated to mimic the edges of a wrap around hanfu robe, but would actually fasten at the neck. This is the type of dress my characters might have encountered, and the heroine actually wear. 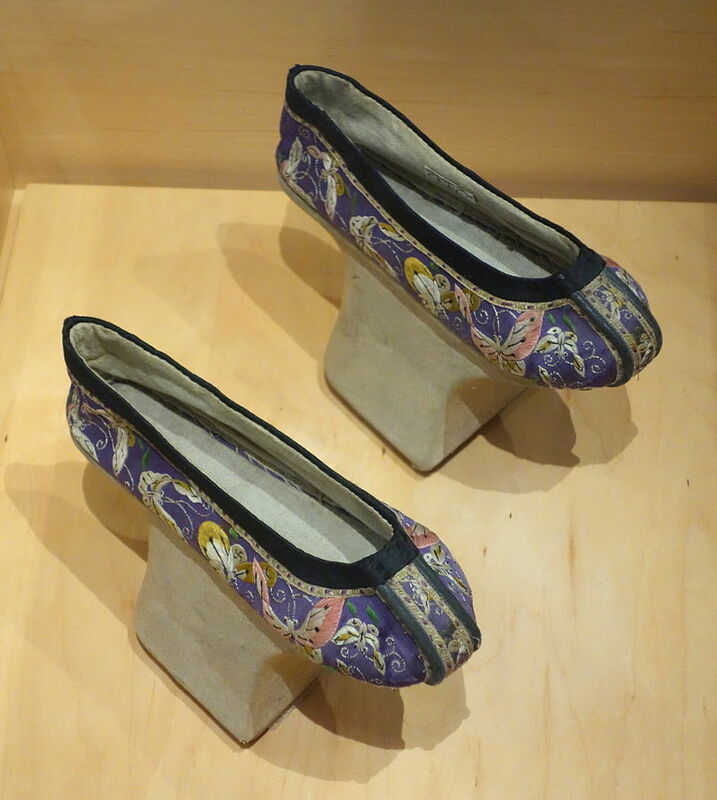 Foot binding, which westerners associate with China, belonged to the ethnic Han majority and was practiced at least among upper class Han Chinese families. It showed the world that the family (which is to say the husband) could afford a useless mouth to feed. It is often the case that women of wealthy classes in many societies dress in ways that clearly signal that these women have no need to engage in manual labor. The mindset isn’t unique to China. Think of Scarlet O’Hara cinching her waist so tight she could not eat. Bustles and stiff crinolines demonstrate the same principle, and so did the wide sleeves of the aoqun. Only a wealthy woman with servants could manage to dress like that. Bound feet demonstrated wealth by showing that a woman had no need for labor, and as such became an irresistible symbol of class. As is often the case, the lower classes mimicked the practice, sometimes to a lesser degree. The practice was painful and its details ugly, but it must have been attractive to women because the first Qing emperor felt the need to decree that Manchu women must not bind their feet. Han women continued the practice well into the twentieth century. 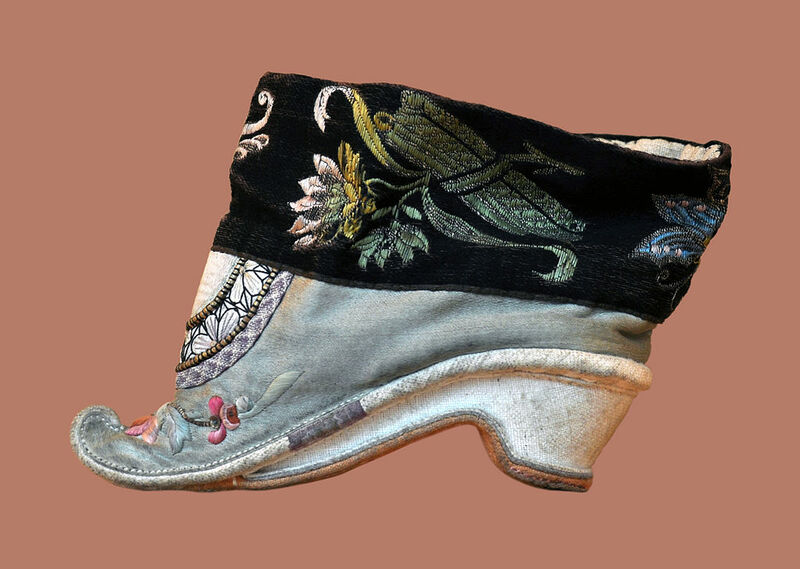 Bound feet created a swaying, mincing walk and required the use of “lotus shoes,” designed for the tiny, narrow pointed lotus feet that resulted from binding. Manchu women did not bind their feet and they wore elevated shoes called “horse hoof” or “flowerpot” shoes (depending on the shape and size of the platform underneath) hidden under their skirts. Some authorizes say it gave them a distinctive walk. Others say it enabled them to mimic the gait of bound feet. In either case it certainly made them taller than Han women. The most beautiful aspect of all this fashion lies in the textiles used to create it. Silks and cottons, beautifully dyed and, among the wealthy classes, gloriously embroidered make it beautiful to look at even now. I wonder what Jane Austen would have made of it. For more information on this topic, I suggest images over text. The textiles are glorious. A lifetime ago Caroline Warfield majored in East Asian history in college. Now she dreams of romantic adventures for the characters that pop into her head. History, travel, and love of family fuel her stories. In addition to History Imagined, she is a regular contributor to The Teatime Tattler, a blog in the shape of a fictional nineteenth century scandal sheet. She is currently working on a romance involving the British in China in 1838, the third book in her Children of Empire Series. Caroline, what great information! I’ve been fascinated by the Chinese manner of dress and the binding of the women’s feet for a long time. 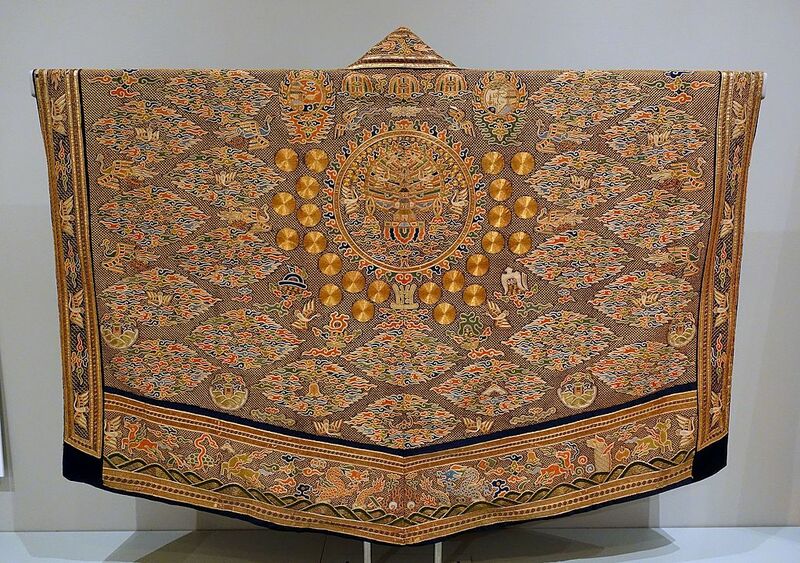 And, as a former quilter, the textiles amaze me. Great post, Caroline! Love the topic and info provided from your research! I have been an Amy Tan fan since The Joy Luck Club. She has some rather gruesome descriptions of foot binding in her books. What amazed me was that it was the mothers and grandmothers who held the little girls down and did the damage. Puts one in mind of what we do to our feet when we wear 4 and 5 inch stilettos! Not as damaging, permanent, or painful, but affects the gait nonetheless.